Looking for the cheapest pricing for all Lexmark toner? If your laser printer is running low on toner you can receive brilliant cost savings by simply ordering any of your replacement Lexmark E332 toner cartridges supplier. Cartridge Save have a lower price commitment so that you get fantastic discounts for Lexmark E332 toner cartridges without the need to to go shopping in less affordable PC hardware stores Moreover, we only supply Lexmark E332 toner that are really high quality and additionally cheap so then you'll get peace of mind with every order you make! Brilliant Deals Now On Lexmark E332 Toner Cartridges! You can get free delivery on Lexmark toners. This particular great value Lexmark E332 laser toner may be ordered online simply by using our secure shopping checkout so don't miss the opportunity and purchase now for the chance to save money. However, you could order this cheap Lexmark E332 toner cartridge by simply telephoning the order number directly when the time suits you best. Remember, Lexmark E332 toners supplied by us will also be protected with a guarantee that gives you the chance to get a 100% refund so customer support is by no means far from reach. We're giving you speedy delivery, solidly built toner cartridges and the lowest prices. It makes sense for you to opt for us for E332 toner supplies. Designed for offices with high-volume paper handling needs, the Lexmark E332 is capable of delivering 15,000 monochrome prints per month. Users can expect good quality output delivered at reasonable speeds plus they can print complicated print jobs, thanks to the built –in 32 MB memory that can be expanded to 160 MB. The Lexmark E332 is compatible with Macintosh, UNIX, Windows, and Linux operating systems. Ethernet is not standard to the unit and there are no finishing options or a duplexer. The compact Lexmark E332 laser printer stands 9.8 inches and it can handle a maximum of 800 sheets. Parallel and USB 2.0 interfaces are provided, together with a control panel with LED indicator lights. The Lexmark E332 mono laser printer has a decent print speed of 27 ppm and it is installed with PCL 6 Emulation, PPDS and PostScript 3 printer languages. The E332 printer delivers solid greyscale images and text documents. The Lexmark E-332 is very easy to use and install plus it works on most operating systems. It has high yield consumables which include the high capacity black return program Lexmark E332 toner cartridge that helps to lower the running costs without compromising print speed or performance. Users have a choice of parallel and USB interfaces for connectivity. The Lexmark E332 printer could be better if it offered a duplexer. Users who need to share the printer will have to purchase either Ethernet or Wi-Fi separately. 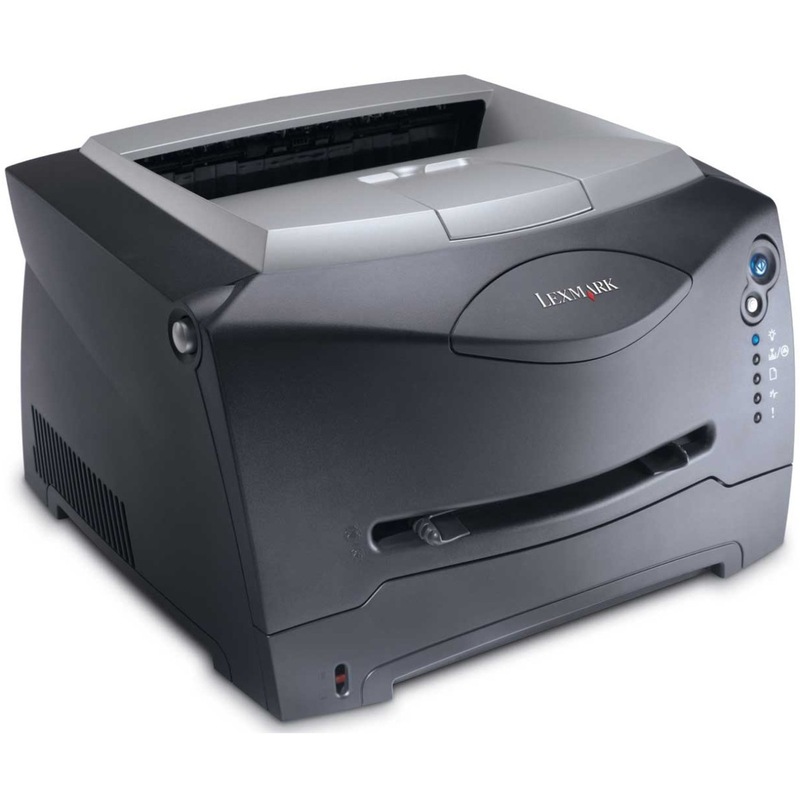 Even with optional paper tray, the Lexmark E332 still has low paper handling capacity.